Rosemary Lee is a choreographer who makes large-scale, site-specific performances, solo works, short films and video installations that explore our relationship to our environment. She trained at the Laban Centre for Movement and Dance and writes and lectures internationally. 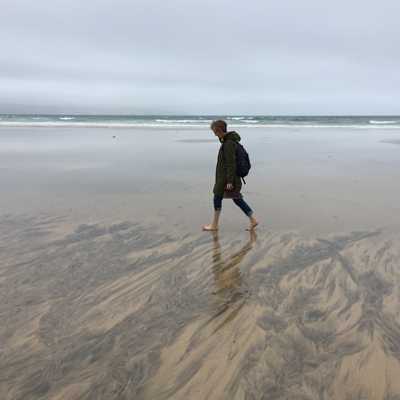 Rosemary is developing a new performance for Par beach near St Austell, commissioned by CAST and Dance Republic 2. The performance will be presented as part of the Groundwork season of international contemporary art in Cornwall this summer. She will talk about the development of this work and a range of projects from her 30-year career. This event is organised CAST as part of Groundwork and hosted by AMATA. Talks are open to students and the public. Admission is free but booking is required. Groundwork is a three-year project bringing international contemporary art to Cornwall, supported by Arts Council England. Field trips, workshops and events during 2016 and 2017 are building towards a season of new commissions and sited work opening in May 2018.